If you picture yourself ensconced in a penthouse suite with king-of-the-world views, Princess Cruises has new Sky Suites to tell you about. The cruise line released details Monday about its new ship, the Sky Princess, which is scheduled to debut in fall 2019 in the Mediterranean. 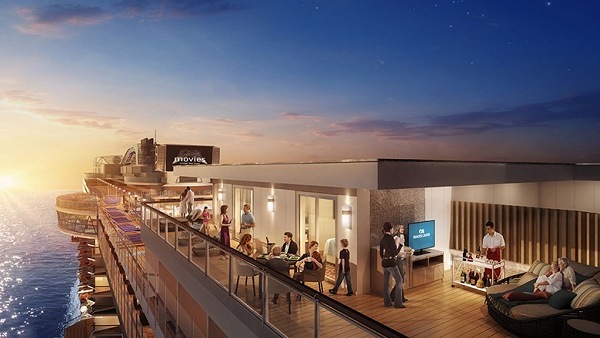 The 700 square foot verandas will give suite guests a private vantage of the ship’s Movie Under the Stars screen. Two of the suites will have 270 degree panoramic views and have sleeping capacity for five guests. The 143,000-gross-ton ship will be the fourth in the line’s Royal class, accommodating 3,560 guests. It will have double the number of private cabanas as on its sister ships. Other new elements include an aft Wakeview pool, two deep-tank top-deck pools, a Retreat pool and more whirlpool tubs than on previous Royal Class ships, including ones cantilevered over the deep-tank pools. 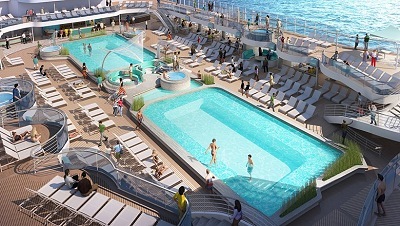 The ship will have twice as many private cabanas as its sister ships. Passengers will find the ship’s Vista Lounge will get a new look complete with a full bar offering, an evolution of the popular lounge on other Princess ships. Guests can take advantage of a new cafe in the Princess Live venue, serving barista-made coffee, tea and quick bites. The keel was laid for the 143,700-ton Sky Princess on July 5. It will carry 3,360 passengers and is set to sail in the Mediterranean in October and November 2019. Prices for an inside cabin start at $1,449 per person, double occupancy, for a seven-day voyage. The ship is to reposition to the Caribbean in December 2019, with prices for a seven-day cruise starting at $749 per person, double occupancy. Princess Cruises continues its multi-year, “Come Back New Promise” – a $450 million-dollar product innovation and cruise ship renovation campaign that will continue to enhance the line’s onboard guest experience. These enhancements result in more moments of awe, lifetime memories and meaningful stories for guests to share from their cruise vacation. The product innovations include partnerships with award-winning Chef Curtis Stone; engaging entertainment inspired shows with Broadway-legend Stephen Schwartz; immersive activities for the whole family from Discovery and Animal Planet that include exclusive shore excursion to onboard activities; the ultimate sleep at sea with the award-winning Princess Luxury Bed and much more.